Just this week, Arnold Schwarzenegger told CNN that Donald Trump was in the wrong for denying climate change and withdrawing the USA from the Paris Agreement. Schwarzenegger, the action star and former Republican “Governator” of California, advocated the need for communities and countries to rally together, look beyond borders, and devise immediate goals to save the planet. And if there’s someone who knows a thing or two about saving the planet, it’s Arnold. So it’s no surprise that Schwarzenegger plays a different kind of hero—an eco-warrior—as he lends his narrating skills to the documentary Wonders of the Sea. It’s admirable to see Schwarzenegger contribute his voice and star status to a project that advocates for global change, especially since his message is at odds with his own political party, which consistently favours Big Oil and fossil fuels over clean water and fresh air. Wonders of the Sea invites audiences to immerse themselves in the beauty of the world’s oceans and to see through a camera lens all the magic of life beneath the surface that one can rarely glimpse with the human eye. 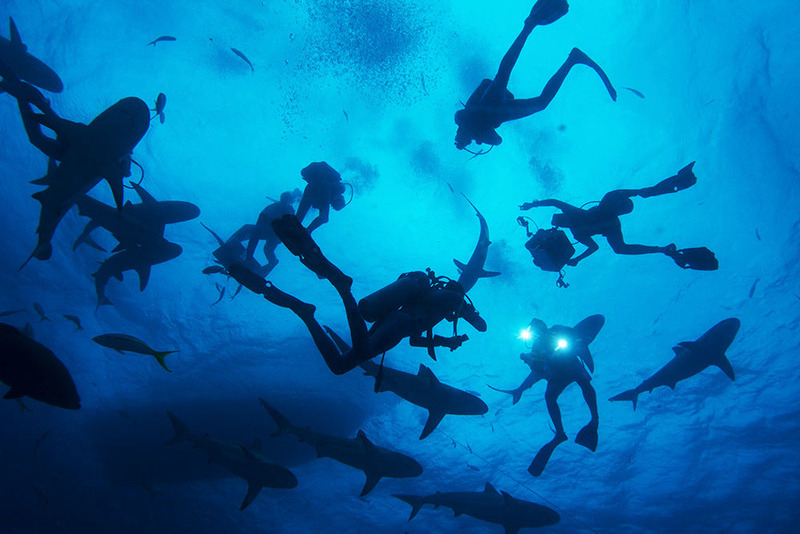 The film tours the Pacific Ocean on an underwater adventure under the helm of director, explorer, and environmentalist Jean-Michel Cousteau, son of famed scientist and three-time Oscar winning filmmaker Jacques Cousteau. Taking a cue from the elder Cousteau’s landmark doc The Silent World, the younger Cousteau plumbs the depths while exploring all facets of marine life. He’s joined by his children Celine and Fabien, along with a trusty team of cinematographers, as the explore the ocean from Fiji to the Bahamas. They comment eagerly and knowledgably about the fish, crustaceans, and coral reefs they encounter throughout their travels while peppering their narration with occasionally corny references to their family legacy and to the Austrian bodybuilder who fills in the voiceover. It’s a nice continuation of the Cousteau oeuvre with new technology affording sights that The Silent World simply couldn’t record. In the 62 years since The Silent World initially wowed audiences, however, countless underwater nature documentaries have dipped their toes into various waters of the world. These documentaries all seem to be the same. And to be honest, they generally aren’t very good. The sights offered by these docs might be unique at first glimpse, but a fish is still a fish and seaweed is still seaweed. There is a formula to their approach with obligatory scenes of sharks swimming in a school whilst the narrator informs the audience that they aren’t nearly as dangerous as Jaws makes them out to be. (But the sharks’ appearance is nevertheless paired with an ominous musical cue.) They often have the icky shots of remoras suctioned to the bottom of other ocean dwellers as they snag a free ride and a free meal. (In this case, the remoras latch onto a jolly turtle and snack on a parasite that’s in his eye, yum yum.) These underwater nature docs pretty much always have the same thread of narration (re: dry) and music cues that range from triumphant to cheesy. Most problematic, however is that they “explore.” They don’t offer much beyond visual fancy and often lack a salient, compelling argument. Wonders of the Sea at least has something resembling one with its glimpse at the riches of the ocean. In observing these similarities, one doesn’t simply mean to be cynical. Rather, one has to question the overall effectiveness of these exploratory glimpses of the ocean floors. 63 years after The Silent World, the waters of Planet Earth are dirtier than ever. Wonders of the Sea, however, isn’t entirely redundant. While one has undoubtedly seen some variation of this documentary, one probably hasn’t seen it done so spectacularly. (Although the film has a 3D release, this review considers a 2D version.) The underwater cinematography is truly commendable. The clarity and proximity of the images ensures that this adventure is among the most visually breathtaking deep sea dives in the documentary ocean. The details of each creature afford audiences a sense of the unique traits that help them survive in their complex ecosystems. The colours are exquisitely vibrant, while the quality of the film technology ensures that the coral and aquatic plant life flow hypnotically in the crystal clear waters. Even a cynical viewer has to admit that Cousteau and co-director Jean-Jacques Mantello nab some extraordinary footage. Highlights include a frisky encounter between a hermit crab and a conch as the crustacean considers moving into a bigger home. Shot with a remarkable range of coverage to get the full shot/reverse shot effect with macro-level close-ups affording a glimpse right into the crab’s eyes, the scene plays out like a comedic skit or a bit from Finding Nemo. Similarly, the doc rides co-pilot with an octopus as it trawls the coral reef to provide a dazzling view of its camouflaging technique and quirky personality. Majestic shots of a giant ray illustrate the scope of the ecosystem beneath the surface. Arnold and company might be successful in relating to viewers that there is a world of wonder in the Earth’s oceans. The images are compelling enough to ensure that the documentary leaves an emotional impact, although the tacked-on and crudely assembled call to action at the end of the film tells another story. Just make sure to recycle those 3D glasses as the first step.